The RVTPO is currently working on a long-term Transit Vision Plan that will help shape future investments and planning for the Roanoke Valley’s transit services in the urban portions of Bedford County, Botetourt County, Montgomery County, City of Roanoke, Roanoke County, City of Salem, and the Town of Vinton. The workshops will be offered at two locations in the Roanoke Valley. • 7 to 9 p.m. at the Brambleton Center, 3738 Brambleton Ave.
RoanokeValley TPO from Dale Saylor on Vimeo. 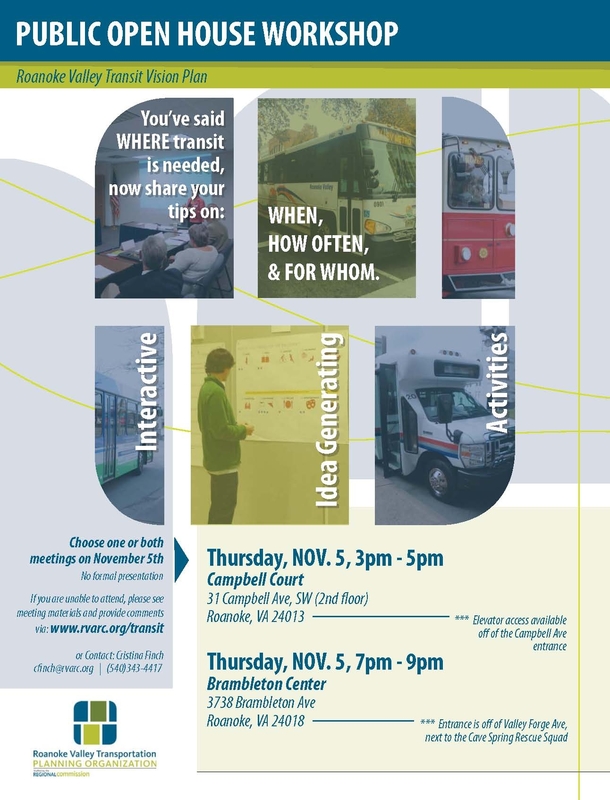 This entry was posted in Transportation and tagged Transit, public input, Long-range transportation plan, public participation on October 30, 2015 by admin. Join us on November 5th for the Roanoke Valley Transit Vision Plan Public Workshops. See Flyer below for details (click photo to enlarge). This entry was posted in Blog on October 23, 2015 by Bryan Hill. Construction of a 12-foot auxiliary lane and new 12-foot outside shoulder along northbound I-81 between Exits 141 and 143. The lane will be an extension of the entrance ramp at Exit 141 to extend to the exit to Exit 143. Construction includes retaining and sound walls, and stormwater management facilities in various locations along the corridor. Project will provide additional capacity between NB Exits 141 & 143 and provide for safer merge movements between exits. Addition of one lane NB and one lane SB on Interstate I-81 between Exits 140 & 143. Lanes will be 12′ wide with 10′ paved shoulders. U.S. 220 in the City of Roanoke at the intersection of U.S. 220 and Valley Ave./Southern Hills Dr. SW (Lowe’s) and terminates in Roanoke Co. at U.S. 220 and Clearbrook Village Ln. (Walmart). There are five signalized intersections within the study area. All intersections will be synchorinzed to allow better morning and afternoon peak traffic flows. New cameras will be installed at all five intersections allowing VDOT to remotely access the traffic volumes and view live traffic to monitor coordination on the corridor. This project seeks to light interchanges along I-81 beginning at Exit 137 and continuing with exits 140, 141, 143, 146, and 150. The project area is roughly 13 miles along I-81, and passes through Roanoke County, the City of Salem and Botetourt County. Construction of 1.875 miles of Roanoke River Greenway in Roanoke Co. and the City of Salem, from Green Hill Park upstream of Diuguids Lane to Riverside Park, downstream of Mill Lane. This section will include two 12′ bridges across the Roanoke River, a separated grade crossing at Diuguids Lane and an at-grade crossing at Mill Lane, where topography prevents a separated crossing. Construct 12′ auxilary lanes NB and SB from Exit 150 to the truck weigh station, including bridge replacements over Tinker Creek. Construct an extended deceleration lane northbound into the weigh station; and construct an extended acceleration lane southbound out of the station. Establish a three-lane road, both NB and SB between Exit 150 and the weigh station, extending ramps south of the station. Provide additional capacity between Exit 150 and the station. In the days since the application deadline, applications have undergone validation at the VDOT District, VDOT Central Office and screening through the Office of Intermodal Planning and Investment (OIPI). OIPI verifies that each candidate project meets at least one of four needs in VTrans2040, the Virginia Multimodal Transportation Plan. Currently, all projects submitted by the RVTPO, for the exception of the I-81 Interchange Lighting project, have been forwarded to and successfully screened in by OIPI. Once that verification process is complete, the candidate project is forwarded to a scoring panel of statewide transportation and public policy officials. The scoring process will be ongoing this fall and into the beginning of 2016. It is anticipated that the project award announcements will be made in January 2016. Future posts will discuss the type and nature of HB2 projects submitted statewide and provide insights and impressions of this inaugural prioritization process. This entry was posted in Transportation on October 22, 2015 by Bryan Hill.